Danelina Vacheva1 , Verjinia Simeonova2, Boyko Stamenov2. 2) Faculty of Physical Medicine, Rehabilitation, Ergotherapy and Sport, Medical University Pleven, Bulgaria. Bulgaria is in a leading position concerning morbidity and mortality rate from cerebrovascular disease (CVD). The goal of this research was to examine, follow up and assess the recovery and the ability for food preparation and feeding in patients with CVD. Materials and methods: Sixty one patients were included in the research. All of them underwent physical rehabilitation program, based on their individual status. The program included: kinesitherapy, labour-therapy [(occupational therapy (OT) and activities of daily life (ADL)]; electrotherapy. The patients were assessed twice: in the beginning and at the end of the rehabilitation course. They self evaluated the basic parameters nevertheless which of the limbs was particularly affected. Wilcoxon rank test was used for the statistical analysis of non parametrical data and distribution. Results and analysis: At the end of the rehabilitation course the Wilcoxon’s curves were found shifted to the right, which confirmes improvement of the main parameter (self independence in the main task set to be fulfilled), no matter which limb was paretic. Conclusion: Early initiation of the rehabilitation course including labour activities and elements of ADL, given as instructions is essential for achieving better results in the rehabilitation of patients with CVD and for enhancing the self service ability. Functional OT stimulates the independence of patients and facilitates their recovering to independent everyday life and social activities. Key words: rehabilitation, occupational therapy, cerebro-vascular disease. Vacheva D, Simeonova V, Stamenov B. RECOVERY ASSESSMENT OF DAILY AND LABOUR ACTIVITIES (FOOD PREPARING AND FEEDING) IN PATIENTS WITH CEREBROVASCULAR DISEASE. J of IMAB. 2013 Jul-Dec;19(3):448-452. 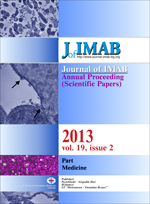 DOI: 10.5272/jimab.2013193.448. 3. Pedretti LW, Early MB. (2001). Occupational therapy: Practice skills for physical dysfunction. (5th ed.) St. Louis, MO: Mosby. 4. Radomski MV, Trombly CA. Occupational Therapy for Physical Dysfunction. Baltimore, MD [etc.] Wolters Kluwer/Lippincott Williams & Wilkins, 2008. 8. Punwar AJ, Peloquin SM. Occupational Therapy: Principles and Practice. 3rd edn. Lippincott Williams & Wilkins, 2000; pp.303. 10. Sinaki M. Basic clinical rehabilitation medicine. Toronto – Philadelphia: W. B. Saunders Co, 1987. 13. Hannecke van Bruggen. Occupational therapy (ergotherapy) – philosophy, objectives and methodology. Rehabilitation Medicine and the Quality of Life, 2007; 2: 16. 14. Kielhofner G. (ed.) (2008) Model of human occupation: theory and application, 4th edn. Lippincott Williams & Wilkins. 18. Rusk HA. Rehabilitation Medicine: A Textbook on Physical Medicine and Rehabilitation, 2nd Edn, Mosby Co, St. Louis. 1964. 668 pp. 19. AOTA Council on Standards. Occupational therapy – its definition and function. Amer. J. Occup. Therapy. 1972; (26): 204-205. 20. Hansen RA, Atchison B. Conditions in Occupational Therapy. Baltimore: Williams & Wilkins, 1993. 21. Topuzov I. Occupational Therapy. ІІІ part; Sofia: RIK "Simel". 2009. [in Bulgarian].